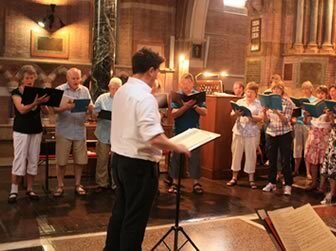 In 2011 the Bach Choir mounted its first major tour in recent years (their first tours being in the 1970s to our twin towns of Marburg and Poitiers), with a five day visit by nearly fifty choir members to Rome, singing an Ascension Day Mass in the Basilica di San Pietro in Vaticano (with a congregation of over 1000 and live radio broadcast) and a concert and Choral Eucharist at the Anglican Church of All Saints. The repertoire for tour was billed as “Mozart and his English Contemporaries” … we were advised that “everyone” brought English Romantic and Italian music to sing in Rome, so if we did something a little different, we would get a larger audience – and we certainly did! 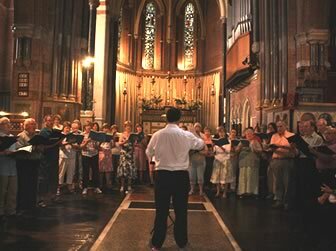 Alongside our main concert work, Mozart’s Requiem, we brought Haydn’s Missa Sancti Ioannis de Deo (Little Organ Mass), and English works suitable for Ascensiontide: Boyce’s setting of the Jubilate Deo, Croft’s God is gone up with a merry noise, Greene’s Honour and Majesty and Battishill’s stunning O Lord, look down from heaven. For the Mass in the Vatican we also brought Stanford’s magnificent double-choir motet Cœlos ascendit hodie, which was our final offering there, bouncing from one side of the building to the other. 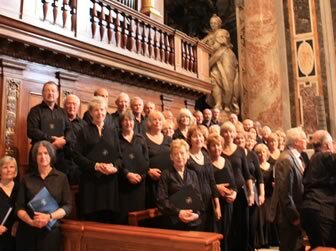 “Nearly fifty members of the choir – including guests from other choirs and our organist for the trip, including our Organist, James Bull from Llandaff Cathedral – assembled in Anzio on the evening of 1 June at the Grand Hotel Dei Cesari. Some of the group had travelled independently, but the majority had endured the strictures of budget flight and arrived safely at the destination. Anzio – on the coast, some 60 km from Rome – was our base for the visit and proved a charming place to stay, as quite a few of the party enjoyed a swim in the sea, or the hotel’s own pool. We dined together in the hotel for our first night and most retired early to prepare for the packed programme ahead of us. The following day saw us travel to Rome to All Saints Church in the Via del Babuino – our base for rehearsal and the venue for our Friday evening concert and Sunday morning service. Parking for coaches is difficult in Rome and impossible in the Via del Babuino so we parked some distance from the venue, and gamely set off on the fifteen-minute hike to the church, taking in the famous Spanish Steps with which many of us were to become all too well acquainted by the end of our visit! We rehearsed together in the morning – joined by two very helpful and keen tenors from All Saints – both resident in Rome. We followed this with a brief meal break and a bus tour of the eternal city. Our first visit coincided with a public holiday in celebration of the unification of Italy and, though this made the tour a little difficult to complete as planned, we did manage to visit the Colosseum, the Pantheon and the Basilica of St Paul – whetting our appetites for further visits. 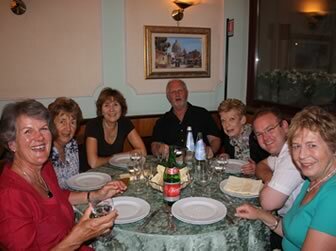 Our first day concluded with a meal in Rome and we travelled back to Anzio for the night. The following day began for some with an early morning swim in the sea – but for the majority with a leisurely breakfast, before we set off once more for a rehearsal at All Saints in Rome. The afternoon was taken up with a wonderful visit to the Vatican Museum and, of course, to the magnificent Sistine Chapel. We enjoyed the services of an excellent guide whose knowledge and enthusiasm impressed us all, as did her evident delight in the muscular carvings! Every one of us was struck by the scale and grandeur of the Vatican City itself and by the conspicuous opulence of the exhibits. Despite the crowds we were able to see a great deal – though, as always, there was too little time to really take in the glory of the Sistine Chapel. After a brief rehearsal, we grabbed a bite to eat and returned to All Saints to sing our concert. Gary says 'The Wine is on Me'! At the evening’s concert, a capacity audience listened intently to our performance of the music of some of Mozart’s English contemporaries followed by a performance of Mozart’s Requiem. Mr Bull accompanied the choir expertly and the four soloists played their part too, in a well-attended and well received concert. 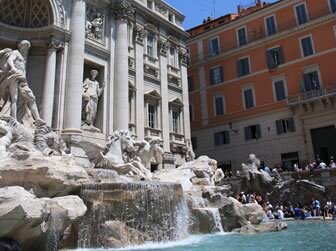 Saturday morning saw some intrepid travellers taking the train into Rome for some extra sightseeing whilst others spent a more leisurely morning in Anzio – on the beach or at the hotel pool. We all met up in the early afternoon on the Via della Conciliazione close to the Vatican – all blissfully unaware of the chaos which was to follow! 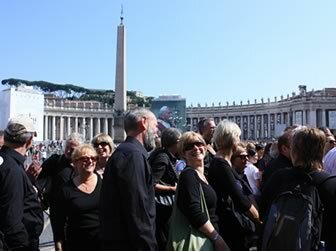 Getting into the Vatican – even dressed ready to sing and accompanied by a guide – borders on the mission impossible. Literally thousands of people converge on a handful of security checkpoints to have their bags x-rayed and to be searched. Orderly queuing does not seem to be the norm and apparently – as it was a Saturday – there are even fewer checkpoints open. We bravely battled our way to the front in blazing heat – all dressed in black, of course, to soak up the heat a little more effectively! With some pushing and shoving we eventually all gained entrance with only a few minutes to spare and took our places in the choir stalls in the Basilica itself. Estimates vary as to the size of the congregation for the 5.00pm Ascension Day Mass, but the Cardinal celebrating the Mass said that it was certainly over a thousand and the service was relayed to those outside in St Peter’s Square and was on Vatican Radio! The choir sang several pieces as ‘dictated’ by Vatican officials who took a keen interest in what we sang and when we sang it. A quick repeat of one item was necessary to fit the time scale of the service. It was a wonderful experience to sing in such a glorious setting and one that surely none of the choir will ever forget. We received a kind mention from the Cardinal who officiated at the mass and all of us will treasure the memory of singing under the magnificent dome of St Peter’s Basilica. When the service finished, we were able to take in the majesty of the Basilica, including a glimpse, behind its glass screen, of Michelangelo’s Pieta. The day concluded with a convivial meal at a local restaurant – an excellent end to an exciting and memorable day. Sunday morning, our last day in Rome, saw the choir return to All Saints to sing for the morning service. That very Sunday was a special occasion for All Saints, as they were celebrating 20 years with their incumbent, Fr Jonathan Boardman, with the guest Preacher Fr Simon Godfrey, Chancellor of St Paul’s Pro-Cathedral, Malta, and former Rector of Northampton . The congregation kindly invited us to join their celebrations – with prosecco and cake. We were also invited to join their ‘bring and share’ lunch – a lavish spread indeed. This meal brought to an end our time in Rome and without much more ado we headed back to Via Ludovisi – our customary coach stop – to travel to the airport for our flight home. Huge thanks must go to Mrs Woods for the organisation of the whole trip. She shepherded us about, got us to places on time, and generally made the whole experience painless for us – though probably not for herself. A large amount of planning and preparation had obviously taken place in advance and during the trip itself she had to react to changing circumstances and yet, through all that, she still actually seemed to be enjoying it! We know she heaved a sigh of a relief when we touched down back in England. Mr Bull, too, is to be thanked for his contribution, not least for the minor Welsh flourish which he managed to include in one of his organ pieces in St Peter’s! The whole experience would, of course, have been impossible without our Musical Director. His obvious love of the music and his attention to detail ensured that we gave the best performances we could. In St Peter’s, he had to operate under very difficult conditions where things were changing at a moment’s notice and yet he remained calm and unflustered throughout. Words cannot truly express our continued gratitude to Lee for his outstanding leadership of the choir.